I am one of the two students working part time in Inviso. Here is how my first experience with Tableau went.In May this year, I was called in for a job interview in Inviso. It was a 30 minutes chat about my study and previous student jobs. The following day Inviso called to say that they found my interview interesting and would like to see me for the second round. This time however they would like me to present "interesting findings" from a dataset, which they would email to me. The findings should be presented in Tableau. It was 11 AM Tuesday, I was to present at 10 AM Thursday and at the job interview the previous day I had heard about Tableau for the first time ever.I cleared my schedule and called some friends to find out if anyone knew about this program - with limited time a little help from a friend would be very much appreciated, but I was out of luck since none of my fellow students were familiar with the program.I opened my mailbox and looked at the data. I quickly realized it was sales data, but struggled to find interesting patterns. Furthermore, the spreadsheet contained another sheet name "returns". How should I connect these data sources and use the information of returned orders? 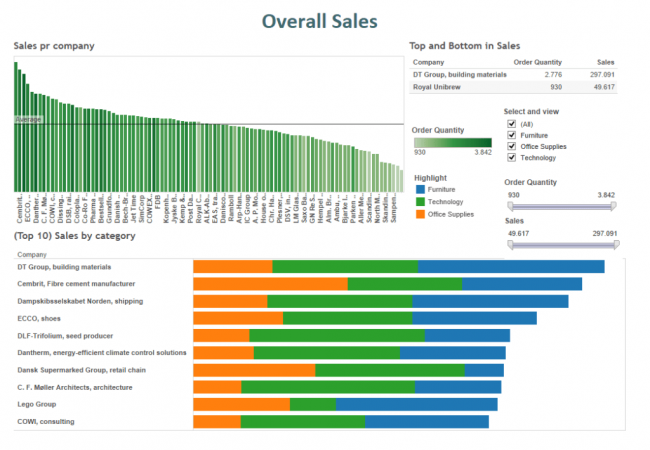 I downloaded the trial version of Tableau to give it a shot.Connecting the data proved easier than expected. The sheet names showed up automatically when I connected to the excel file and by simple drag and drop I placed and connected the sheets. I made a left join as depicted below and was ready to work with my data. So far so good.New questions popped into my head - How do I make the visualizations? What is a dashboard? How do I build sheets? What was this company selling furniture, technology and office supplies?Luckily, Tableau is very intuitive and has a great community and online videos, which made it possible for me to understand the very basics of Tableau quickly, and my fear of going to the second interview empty handed because I did not know Tableau, was replaced by a curiosity for the possibilities within Tableau.How did my dashboards look? 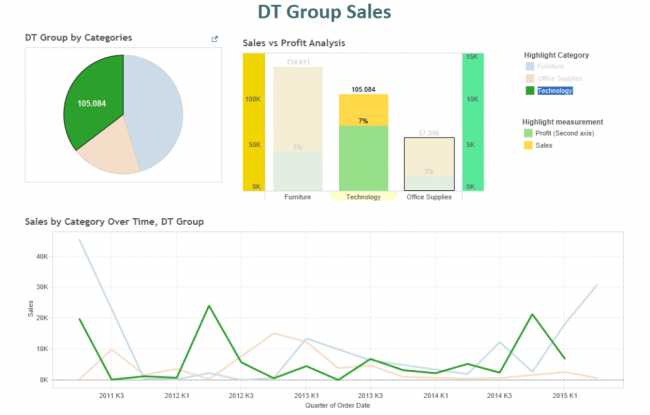 Below is the first dashboard giving an overview of sales. Obviously, I was found of the dashboard filters, which made it easy to change the look of my first dashboard - I really liked the interactivity Tableau provided. The DT Group proved to be the biggest customer and I chose to look in to this. 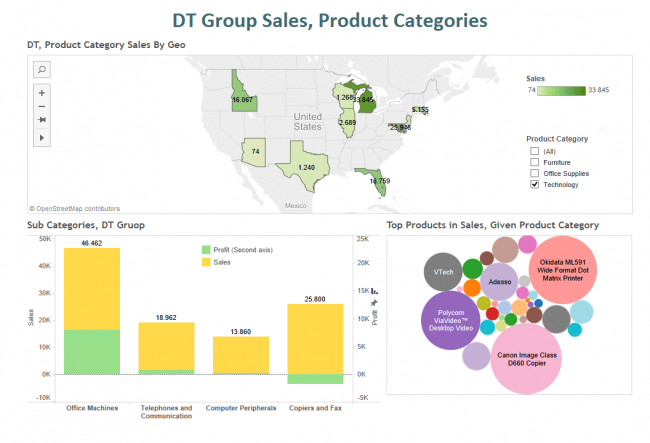 Thus my second dashboard was showing sales to the DT Group and showed how technology sales was providing the highest profit ratio, a variable I created as a calculated field (Which online videos introduced me to). In the third dashboard, I played around with different types of visualizations and even made a map. I have always thought creating visualizations with maps was way out of my reach, but Tableau taught me something else. 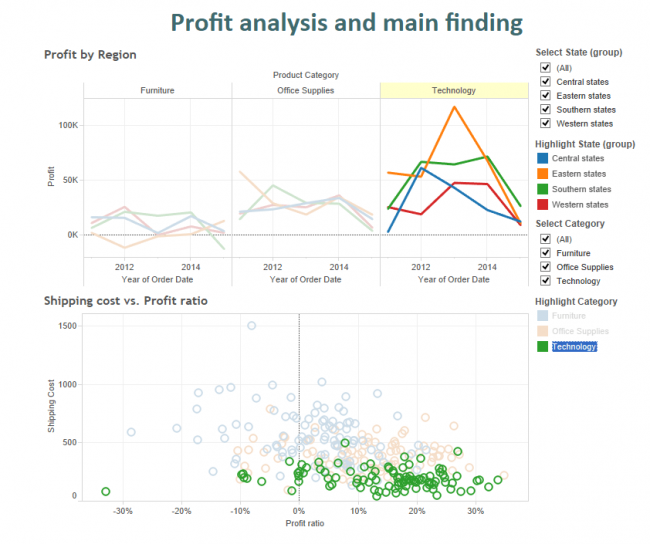 After spending two dashboards on looking into DT Group, I tried to see whether it was a general pattern that technology was providing profits.It proved to be - Technology was having great profit ratios and the lowest shipping costs over the three main categories, which were then the interesting finding. I spent the first half day on looking at data, downloading tableau and contacting friends (without any luck). I then spent a day switching between watching videos on tableau and creating visualizations, and finally spent the last half day on practicing my presentation.I presented my dashboards, which was a good experience and the next day Simon called to offer me a desk in the Inviso office, where I like the other student are now working an average of 15 hours a week.I am still new to Tableau and looking back on my dashboards, I can see that there was room for improvements, but then again these were made within 48 hours of the first time I heard of Tableau. I am learning new features in the software every day and I am looking forward to further exploration.